RALEIGH, N.C. (AP) — Gonzaga and Virginia have become the clear choices for AP Top 25 voters. The Zags and Cavaliers were ranked 1-2 atop Monday's latest poll, marking their third straight week in those spots. But it was the first time in those weeks that the two teams claimed all the first-place votes. The Zags (29-2) earned 41 of the 64 first-place votes while the Cavaliers (28-2) earned the remaining 23. They had all but five of those first-place votes when they first rose to their current perches two weeks ago, then all but one in last week's poll. For Monday's poll, voter Graham Couch of the Lansing State Journal moved his vote from Duke to Gonzaga after the Blue Devils' second loss to third-ranked rival North Carolina. Two other voters — Donna Ditota of the Syracuse Post-Standard and Zach Osterman of The Indianapolis Star — switched from Gonzaga to Virginia. Both teams look like favorites for No. 1 seeds for the NCAA Tournament as they enter their league tournaments. Gonzaga's only losses have come to UNC and No. 8 Tennessee , while Virginia's two losses came against Duke — which had freshman star Zion Williamson healthy both times. 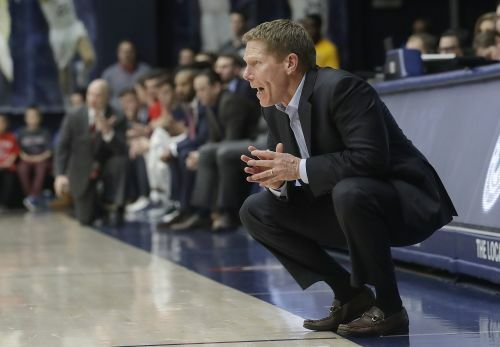 Gonzaga didn't play last week after wrapping up its regular-season schedule on March 2. The Zags return to the court against Pepperdine on Monday night to start play in the West Coast Conference Tournament. Virginia beat Louisville at home Saturday to finish tied with UNC atop the Atlantic Coast Conference regular-season standings, though the Cavaliers will have the No. 1 seed for the ACC Tournament in Charlotte, North Carolina, by virtue of winning last month's matchup with the Tar Heels. The Tar Heels (26-5) have lost just once since mid-January and remained at No. 3 for a second straight week after earning their first regular-season sweep of Duke since 2009. Kentucky climbed two spots to fourth, followed by the Blue Devils — who are hoping to get Williamson back for the ACC Tournament. Williamson has missed nearly six full games since suffering a knee sprain in the first loss to UNC, though coach Mike Krzyzewski has said the 6-foot-7, 285-pound Williamson is expected to start contact work in practice this week. Michigan State, Texas Tech, Tennessee, LSU and Michigan rounded out the top 10. Preseason No. 1 Kansas fell four spots to No. 17 following last week's end of the Jayhawks' 14-year run of winning at least a share of the Big 12 regular-season title. Kansas fell out of the top 10 in late January and dipped to 15th two weeks ago. Those have been the lowest rankings for the Jayhawks since the 2013-14 season, when they twice dipped to No. 18. Four teams rose three spots to make the biggest climbs of the week: Michigan State, No. 14 Nevada, No. 15 Kansas State and No. 21 Maryland. Michigan State (Big Ten) and Kansas State (Big 12) both made their jumps after claiming a share of their league's regular-season titles. In all, 12 teams moved up in this week's poll. Marquette is trying to stop a four-game losing streak as it enters the Big East Tournament. The Golden Eagles also had the biggest fall of the week, sliding seven spots to No. 23 after going from unranked in the preseason to spending four weeks at No. 10 — most recently two weeks ago. No. 24 Cincinnati joined Kansas in falling four spots, while Tennessee and Michigan each fell three. Nine teams slid in this week's poll. UCF slid out from its No. 25 ranking last week. That had been the program's first AP poll appearance since spending four weeks in the rankings during the 2010-11 season. The Atlantic Coast Conference and Big Ten each had five ranked teams to lead the nation. In addition to its three top-five teams, the ACC had No. 12 Florida State and No. 16 Virginia Tech. And the Big Ten had No. 13 Purdue, No. 19 Wisconsin and Maryland joining its two top-10 teams. The Southeastern Conference had four teams, followed by the Big 12's three. The American Athletic Conference (No. 11 Houston and Cincinnati) and the Big East (Marquette and No. 25 Villanova) also had multiple ranked teams.